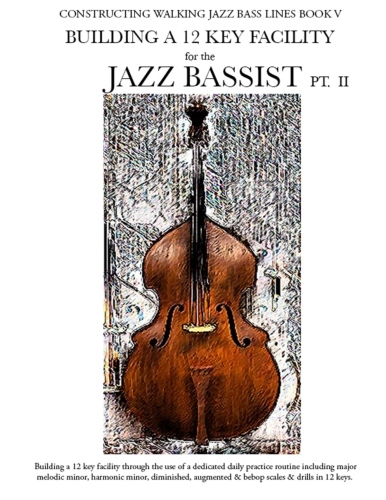 Bass Lessons for Upright Bass and Bass Guitar. A developed system of stepwise learning to build bass technique, jazz harmony knowledge and musicianship. Bass Lessons and where to start. Studying with a good bass teacher is important for the beginning student and can also be beneficial to those that are more experienced. Sometimes just hearing a different perspective on a common topic or device can inspire motivation and the rejuvenate the creative thought process. Depending on where you are, it can be difficult to find a good teacher. Over the years of teaching different levels of students I have developed a system that enables a student to work on what they are interested in, while learning rudiments and fundamentals at the same time. Heres an example. Working on a jazz walking bass line. A student comes in and wants to learn the intro to So What by Miles Davis. Working out the bass line involves many different aspects. Theres the technical side, how to finger the bass line on either upright bass or bass guitar. What is the underlying harmony or function of the piece being played ? As well as the ear training side, listening to the piece of music and finding it on the bass. Working out a part, if done correctly can help you to learn more than one thing at the same time. My lessons work around this strategy of using fundamental bass building blocks. Developing an awareness of jazz harmony, ear training and technical facility while learning a piece or topic the student enjoys. Its a matter of making a series of small steps that combine to make the player much more experienced as a bass player in any setting. To learn more about bass lessons from anywhere in the world contact me at.. I use the same type of lesson system made famous by the great jazz teacher Charlie Banacos. Its a series of recorded lessons to work on areas the student wants to learn sent via email. Study bass anywhere in the world with online bass lessons. All lessons are designed for the students goals and skill level.